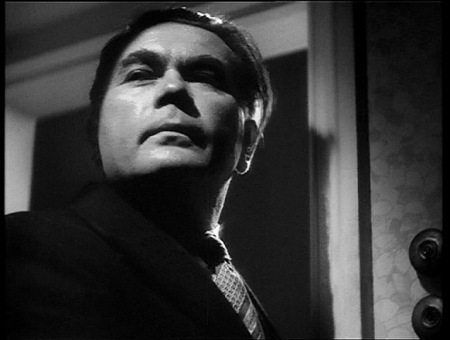 Oscar Homolka is a man of secrets. Who isn’t a sucker for a world that never existed? Break ‘is leg, indeed! Imagine a law enforcement officer with enough time on his hands to make a fuss about lettuce! It’s ridiculous! Yes, it would seem like a simpler life, in a simpler time, unless you’re stressed-out Sylvia Sidney and married to creepy Oscar Homolka. Homolka is Mr. Verloc, a slightly odd man who owns the Bijou Cinema. He has a thick accent and sinister eyebrows, and is inexplicably married to a much-younger, beautiful British woman (Sidney). Sidney’s character, in between running the theatre and fixing gourmet meals, looks after her kid brother (Desmond Tester). Unbeknownst to everyone, Homolka’s character moonlights as a saboteur. In the film’s opening, he puts sand in an electrical generator which causes a power outage. But this does not satisfy his sabotage superiors, and they ask him to do something more sinister, such as planting an explosive device in a cloakroom in Piccadilly Circus. Homolka is told to plant the device early on a Saturday afternoon; it is timed to go off at 1:45 pm. However, because the police are watching him and his house, Homolka cannot leave. He has the bomb but there is no way to dispose of it. However, he realizes the boy, his wife’s beloved kid brother, could transport the bomb without arousing suspicion. Yes, of course! The bomb could be disguised as film reels that need to be returned to Picadilly Circus! The boy need never know the truth because surely he could deliver the package in time! This is where Hitchcock toys with his audience. Turns out the kid brother doesn’t walk, he meanders. He becomes distracted by a street performer who demonstrates personal grooming products. Then he stops to watch a parade. Finally, realizing the time, he decides to take a bus, even though the flammable film reels (not to mention EXPLOSIVES) are not allowed on public transport. Hitchcock never fails to remind us of the time of day; he keeps showing clocks that are counting down. It’s 1:30, and the boy is still on the bus, innocently clutching the explosives. It’s 1:35; now 1:40! The bus is stalled in gridlock traffic! It’s 1:43! 1:44! Well, the boy comes to a bad end and at that moment you are filled with rage and disbelief. Suddenly, this is no longer genteel London where bobbies fuss over dropped lettuce. This is a dark, twisted London where saboteurs kill innocent children and shrug it off as the price of doing business. Some movie scenes will always stay with you. You may forget the actors, or the title, or details of the plot, but there are certain things that will never be erased from your memory. If you watch Hitchcock’s Sabotage, we guarantee the scene in Piccadilly Circus is one you won’t easily forget. Sabotage: starring Sylvia Sidney, Oscar Homolka, Desmond Tester. Written by Charles Bennett. Directed by Alfred Hitchcock. Gaumont-British Picture Corp., B&W, 1936, 75 mins. This blog is in support of the Film Preservation Blogathon, hosted by This Island Rod, Ferdy on Films and The Self-Styled Siren. Click HERE to donate to the National Film Preservation Foundation. It is quite troubling when they kill Stevie. Hitch had a bad habit of reminding his audience that terror could strike in the most mundane of situations. You’re absolutely right, Kim. And so was Hitchcock – the worst things can and do happen in the most mundane situations. Ruth, kudos to you on your moving SABOTAGE review! Hi Marilyn, I just added the link. Thanks!